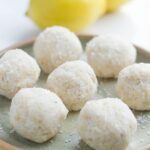 These Lemon Bliss Balls are made with only 5 ingredients and super easy to make (as most bliss balls recipes are). I decided to make these bliss balls with cashews instead of the usual macadamias. I had heaps of cashews and lemons, so have been experimenting and making different treats. These bliss balls were made first and I have also made some cookies, which I will share soon. These bliss balls can also be flavoured using food grade lemon essential oil instead of fresh lemon juice. Roll into balls and place in the refrigerator for 30 minutes to set.